The Large Magellanic Cloud (LMC) and Small Magellanic Cloud (SMC) are two of the Milky Way's closest neighboring galaxies. A stunning sight in the southern hemisphere, they were named after Ferdinand Magellan, who explored those waters in the 16th century. For hundreds of years, these galaxies were considered satellites of the Milky Way, gravitationally bound to our home galaxy. New research by Gurtina Besla (Harvard-Smithsonian Center for Astrophysics) and her colleagues shows that the Magellanic Clouds are recent arrivals on their first visit to the Milky Way's neighborhood. "We have known about the Clouds since the time of Magellan, and a single measurement has thrown out everything we thought we understood about their history and evolution," says Besla. Although they look like glowing clouds to the unaided eye, the LMC and SMC are both irregular galaxies. The Large Magellanic Cloud is located approximately 160,000 light-years from Earth. It's about one-twentieth as large as our galaxy in diameter and holds about one-tenth as many stars. 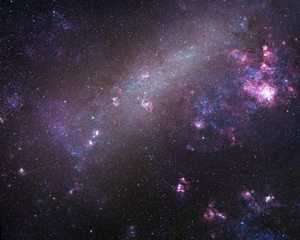 The Small Magellanic Cloud is located around 200,000 light-years from Earth. It's about ten times smaller than its companion and a hundred times smaller than the Milky Way. Earlier this year, CfA astronomers reported measuring the 3-d velocities of the Magellanic Clouds through space with greater accuracy than ever before. The velocities were anomalously high. Two explanations were proposed: 1) the Milky Way is more massive than previously thought, or 2) the Magellanic Clouds are not gravitationally bound to the Milky Way. Further analysis by Besla and her colleagues verified the second explanation. The parabolic orbit they calculated for the Clouds, based on the observed velocities, shows that both are on their first pass by the Milky Way. This result carries several implications. For example, as a spiral galaxy the Milky Way has a large gaseous disk intermixed with billions of stars. That gaseous disk is known to be significantly warped, extending about 10,000 light-years above and below the galaxy's plane. Astronomers theorized that gravitational tides due to previous passages of the Magellanic Clouds caused this warp. However, since the Clouds arrived only 1-3 billion years ago, they are not likely to be the source of the warp. Another puzzle relates to the Magellanic Clouds themselves. A long trail of hydrogen gas called the Magellanic Stream extends behind the Clouds, spanning 100 degrees of the sky from the earth's viewpoint. Some astronomers suggested that the Magellanic Stream formed due to tidal interactions between the Clouds and the Milky Way. Others believed that hydrogen was stripped from the Clouds by gas pressure as they plunged through the extremely tenuous gas surrounding our galaxy. A first-passage scenario rules out both scenarios. "We've been left with a real mystery," says Besla. "One answer has led to many more questions." Finally, the star-forming history of the Clouds themselves must be revisited. Rather than forming stars continuously like the Milky Way, the Magellanic Clouds have undergone several bursts of star formation followed by long quiet periods. Astronomers thought that the starbursts coincided with previous close passes by the Milky Way. This explanation no longer holds true. Instead, interactions between the SMC and LMC may be the primary force driving star formation in both galaxies. In the future, Besla and her colleagues intend to focus on the origin of the Magellanic Stream, conducting N-body simulations to puzzle out possible formation mechanisms. Other astronomers will make direct observations and survey the Stream. The combined power of observational and theoretical research may answer the questions generated by the current work. The paper describing this work has been accepted for publication in the Astrophysical Journal and is available online at arxiv.org/abs/astro-ph/0703196 . Besla's co-authors were Nitya Kallivayalil, Lars Hernquist, T.J. Cox, and Charles Alcock (Harvard-Smithsonian Center for Astrophysics); Brant Robertson (Kavli Institute for Cosmological Physics, University of Chicago); and Roeland P. van der Marel (STScI).